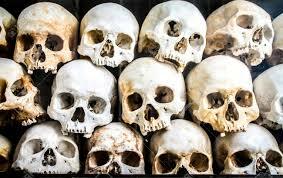 Gukurahundi survivors have applied for permission to petition and hand over skeletons of victims of the 1980’s mass killings to government to press authorities to attend to the emotive issue. According to a letter addressed to Bulawayo police dated January 4, the Gukurahundi survivors upped their push for recognition by seeking permission to hold a memorial procession. The procession has been slated for February 3 where the organisers will hand over skeletons of the Gukurahundi victims at the Mhlahlandlela Government Complex. “Notice to transport Gukurahundi skeletons to Mhlahlandlela Government Complex. We do hereby notify you that on the 3rd of February 2019, we will be holding a memorial procession for Gukurahundi victims from the City Hall at 0900 hours to Mhlahlandlela Government Complex,” the letter signed by the Gukurahundi survivors reads in part. By the time of going to press yesterday, police had not granted clearance to the application. One of the organisers of the procession, Charles Thomas, this week confirmed the development. “We are yet to get any response from the police but we will never rest until the Gukurahundi issue is resolved. We will keep piling pressure on government to attend to the 1980’s genocide,” he said.